Every Friday we will interview a member of the GCS faculty or staff. These "Friday Faculty & Staff Spotlights" will introduce you to our talented teachers and staff, all of whom make GCS so special. This week, meet Miss Natalie Krzemienski. Every Friday we will interview a member of the GCS faculty or staff. These "Friday Faculty & Staff Spotlights" will introduce you to our talented teachers and staff, all of whom make GCS so special. This week, meet Mrs. Catherine Swan. February 1st is our K-8 application deadline. Click here to apply today! Greenwich Catholic School will be hosting Open Houses on Sunday, January 28th at 12 PM for families interested in Kindergarten-Grade 5 and on Thursday, February 1st at 6:30 PM for families interested in our Upper School. Every Friday we will interview a member of the GCS faculty or staff. These "Friday Faculty & Staff Spotlights" will introduce you to our talented teachers and staff, all of whom make GCS so special. This week, meet Mrs. Karen Meese. Every Friday we will interview a member of the GCS faculty or staff. These "Friday Faculty & Staff Spotlights" will introduce you to our talented teachers and staff, all of whom make GCS so special. This week, meet Ms. Carly Hansen. 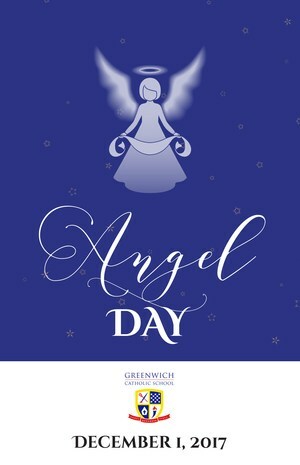 GCS welcomed more than 300 guests to campus on Friday, December 1st to celebrate its 24th Annual Angel Day. Bishop Frank Caggiano celebrated the mass before grandparents, aunts, uncles and special friends were treated to a catered brunch served by volunteer parents. Following a performance by our Kindergartners, the Angels visited students in the classrooms. Click here for pictures from this very special day! Every Friday we will interview a member of the GCS faculty or staff. These "Friday Faculty & Staff Spotlights" will introduce you to our talented teachers and staff, all of whom make GCS so special. This week, meet Mr. Phil Ronca. The schedule and program list for Winter Afters is now available. Registration will open Sunday, Nov 12 at 3pm, and will remain open through Wednesday, Nov 15 at 2pm. As always, programs are filled on a first-come, first-served basis. Every Friday we will interview a member of the GCS faculty or staff. These "Friday Faculty & Staff Spotlights" will introduce you to our talented teachers and staff, all of whom make GCS so special. This week, meet Mr. Justin Carretta.